February 3rd 2016. 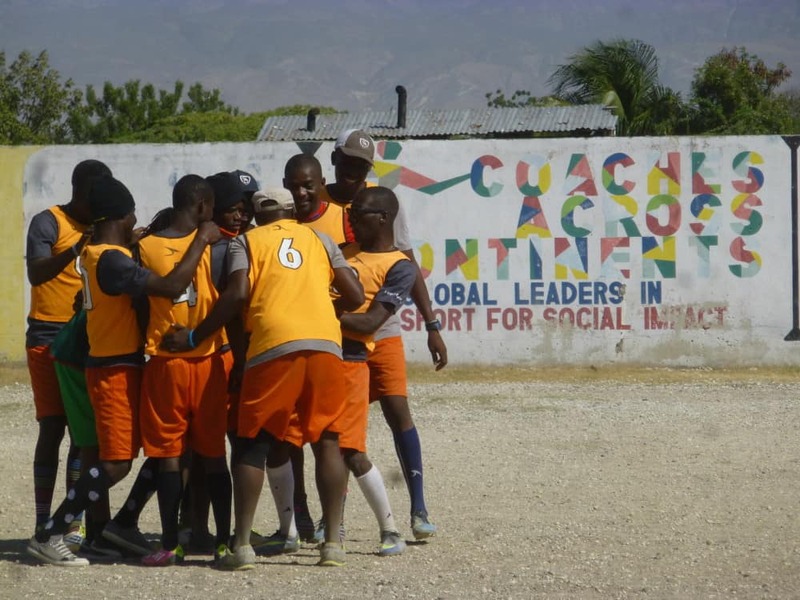 Second-time volunteer, Marissa Segala, writes about our second week in Port-au-Prince with the Haitian Initiative (HI). My second year in the dirt with CAC was equally sunny, warm and enthusing as the first. This time, we spent the first two weeks in city center Cite Soleil working with our third year partner program called The Haitian Initiative. The CAC model involves closely teaching local partners for three years and then allowing the community to take each program as their own; in accordance with the wants and needs of a community with which they are familiar. 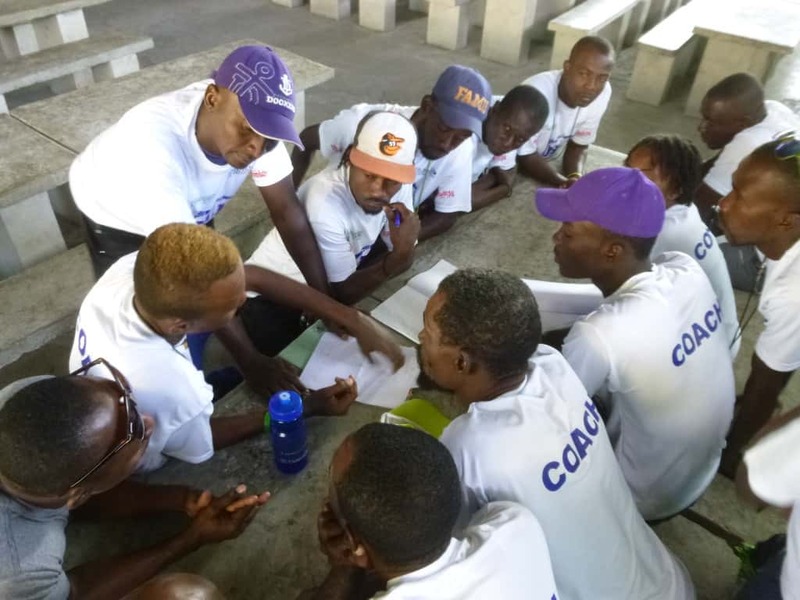 After an intimate first week with only the Haitian Initiative (HI) and other returning coaches, CAC was given the opportunity to observe as the HI hosted their very own week long clinic working with about 100 coaches from several surrounding community programs. It was a thrilling experience to watch the HI coaches as they took the learning, adaptations and creations to the pitch with their own pointed agenda. The CAC skills remained, but the interactive teaching and playing was uniquely HI. One of the coaches was quoted with confidence halfway through the week saying, “We’re so excited, because it really feels like we can do the work just as well as you [CAC coaches]” This may not sound like a compliment, but this is exactly what CAC loves to hear. Confusing, I know. Who wants to be told that someone else can do your job as well or possibly even better than you? Upon further reflection, I realized the underlying implications of this comment. The purpose of a CAC coach is not to be the best one on the pitch or the most knowledgeable relative to those around you, but it is to help create and foster an environment that promotes the growth and development of a multitude of great coaches and thinkers. The HI coaches demonstrated clear command of their own specific agenda, and they executed it flawlessly. It only makes sense that a program could run more smoothly when run by locals who understand the culture, language, people and the issues on a much more intricate level than any visitor could attempt. The CAC model has been executed perfectly by the CAC staff. They are able to provide an opportunity for coaches to engage with and showcase their skills. It indicates a special kind of success that is far more rewarding and complimentary of not just CAC, but all parties involved. I look forward to continuing to work for CAC as well as staying involved with the growth and success of the Haitian Initiative over the next several years. Until next time.